Deal Categories: Nootropic Supplements.Stores: A1Supplements.com. 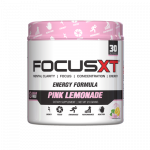 A1Supplements is offering a BOGO FREE on the SNS Focus XT Nootropic. With this promotion you can grab 2 tubs for $44.99, even better, Get Water Bottle free. Choose 2 flavors and go to your cart. Shipping is a flat rate.